Fenugreek leaves are washed and boiled along with moong dal and spices. Oil is tempered with spices and added to the rasam as a final step. Serve fenugreek moong rasam with steamed rice and dollop of ghee. 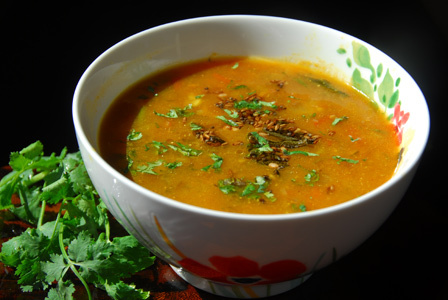 Makes: around 2 Cups of Fenugreek Moong Rasam. Wash moong dal with water and keep aside. Bring to boil around a cup of water in a sauce pot, add washed moong dal. Boil till moong dal becomes just transparent. Add around a cup of water, green chiles, ginger, fenugreek leaves, curry leaves, turmeric powder and salt to the sauce pot. Boil for around 10 minutes or until fenugreek leaves are cooked. When mustard seeds start spluttering, remove from heat and add to above rasam. Boil the rasam for another minute and remove from heat. Serve fenugreek moong rasam with steamed rice and dollop of ghee. Notes: Make sure moong dal is cooked well before adding fenugreek to the pot. Suggestions: Adjust the consistency of the fenugreek rasam with water. 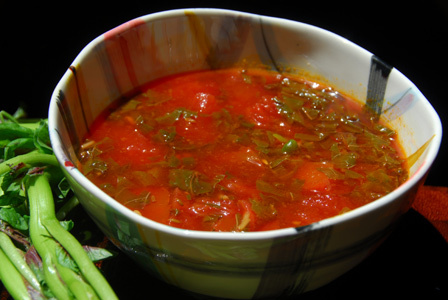 Variations: You can check other rasam recipes here. Other Names: Fenugreek Moong Rasam, Fenugreek Pesara Kattu. Onion is chopped up and cooked in oil along with tomato and garlic. 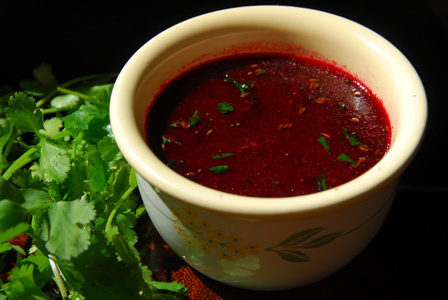 Tamarind is soaked in water and juice is extracted and added to the rasam along with rasam powder. Boil the rasam and serve onion garlic rasam with steamed rice and dollop of ghee. Makes: around 4 Servings of Onion Garlic Rasam. Soak tamarind in half cup of water and extract all the juice and discard any veins. Heat oil in a pan, add chopped onion. Once onion turns translucent, add chopped tomato. Let the tomato cook a bit and crush them with back of the spatula. Stir in chopped green chiles, garlic, turmeric powder and salt. Pour around 1 1/2 cups of water, tamarind extract, jaggery and rasam powder. Boil for around 8 – 10 minutes. When mustard seeds start spluttering, remove from heat and add to above rasam pot. Boil for a minute or two and stir in cilantro. Serve onion garlic rasam with steamed rice and dollop of ghee. Suggestions: Adjust spice with green chiles or add few pinches of red chili powder. Variations: Check other rasam varieties here. For rasam powder recipe, click here. Other Names: Onion Garlic Rasam. Fenugreek seeds are soaked in water for couple of hours and sprouted. Tomato is cooked in spices. The sprouted fenugreek seeds are cooked along with tomato and toor dal along with other spices. Once bubbles for few minutes, fenugreek sprouts rasam can be served with steamed rice and a dollop of ghee. 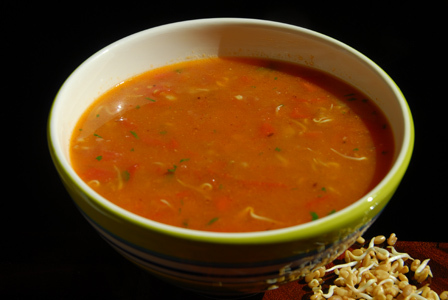 Makes: around 4 – 6 Servings of Fenugreek Sprouts Rasam. Wash, clean and finely chop the cilantro leaves. Wash and pressure cook toor dal in a cup of water for 3 whistles. In another vessel, add the sprouted fenugreek seeds with little water and pressure cook in same cooker for 3 whistles. Alternatively, cook the toor dal on stove top with around 2 cups of water till dal is soft. Mash the cooked toor dal and keep aside. Soak tamarind juice in few tablespoons of water for sometime and extract all the juice. When mustards seeds start spluttering and urad dal changes color, add chopped tomatoes and cooked fenugreek seed sprouts. Cook till tomatoes turn soft, add cooked toor dal, tamarind juice, rasam powder, red chili powder, salt and 2 cups of water. Bring to boil and let it boil for few minutes. Stir in cilantro and adjust any seasoning if required. Serve fenugreek sprouts rasam with steamed rice and a dollop of ghee. Notes: Make sure dal and fenugreek sprouts are cooked well. Suggestions: Use fenugreek sprouts as per your preference. Adjust the consistency of rasam with water. Add more cooked toor dal for thicker dal rasam. Variations: You can also check other recipes with fenugreek here. Other Names: Fenugreek Sprouts Rasam. Amaranth leaves / Thota kura / Chauli is finely chopped and cooked along with tomato and green chiles in lots of water. The rasam is also flavored with rasam powder. Check the recipe for rasam powder here. 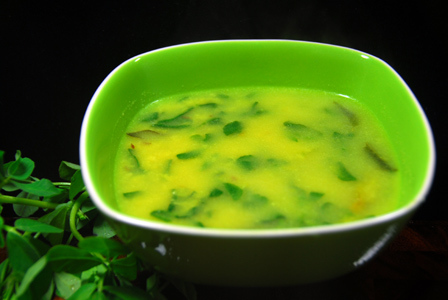 Serve quick and delicious amaranth leaves rasam with steamed rice and dollop of ghee. Makes: around 4 Servings of Amaranth Leaves Rasam. Wash, discard hard stems and finely chop amaranth leaves. When mustard seeds start spluttering, add green chiles, amaranth leaves, tomato, tamarind, turmeric powder and salt. Stir fry for a minute, add 3 cups of water and bring it to a boil. When amaranth leaves change color and tomato turns soft, add rasam powder. Adjust the consistency of amaranth leaves rasam with water if required and boil for another 3 – 5 minutes. Remove amaranth leaves rasam from heat and serve with steamed rice and dollop of ghee. Notes: Make sure amaranth leaves is cooked well before removing the rasam from heat. Suggestions: You can also add the talimpu as a final step rather than making it as a first step in the cooking process. Variations: Garlic pods can also be added to the talimpu for flavor. Other Names: Amaranth Leaves Rasam.